Unique three-arm chandelier with translucent Capiz shells, having lead frames forming teardrop shaped globes. Each pendant light is held by vintage silk cord at three different heights. Quality lead work holding the Capiz shells, no breaks or cracks. The globes open in the center to replace bulb. Overall height can adjust lower, with modifications to support rod. In fine working condition, removed from original Chicago estate, where it was being used as a chandelier, could also be very dramatic if used in large stairwell. Unmarked. Boho modern, Hollywood Regency style. 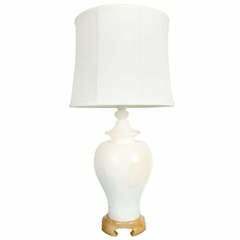 Mid-Century alabaster lamp with sculpted base, Lamp. Shade not included. Measures: 36 H x 17.5, with shade 36 H x 11 D.
Iconic design of cascading layers of shell in a monumental size. Drop from ceiling to top of fixture is 17.5.